Help! Someone stole my babies!! Today we went sledding. The whole way there the 'three year old formerly known as baby Alexis' kept saying, "I'm going to go down the snow hill all by myself". I thought "sure TYOFKABA, you'll take one look at it and be too scared to try it", because, I swear, that's what she would have done LAST WEEK. But what I didn't realize was that TYOFKABA no longer lives with us, she's been taken over by Big Girl Alexis, complete with underpants and everything. By the time I reached the hill, she had already gone down BY HERSELF once, and did it several more times while I was there. You could have knocked me over with a snowball! Isn't someone supposed to check with me before they grow up? I don't recall anyone asking if it was okay that they get bigger and less attached to their mom. Because I would have said "NO". Well, technically I would have said, "they may mature in the sense that they'll feed themselves, wipe themselves, dress themselves, and entertain themselves, but no, they may not grow in size and they may not EVER outgrow their mama". But no one asked, and now I have to deal with the consequences of them growing up. And today Tyler showed up with another tooth, WITHOUT EVEN TELLING ME! He should have gotten out of bed this morning and said, "hey mom, i think I'll get another tooth now, is that alright?" Instead he decided to show the whole world while smiling, without telling his mother first. Thankfully there are still some things they do to remind me they are still young and still occasionally need me. Some of them are nice, some not so nice. 2. Tyler hated sledding and screamed for an hour straight and let me hold his hand in the car on the way home. 3. Alexis could not climb the hill to go down on the sled, so I carried her up it several times. 4. Tyler is a great snuggler when he first wakes up. 6. Neither of them really eat by themselves, so I/we still have to feed them for the majority of their meals. 7. Alexis will still hold my hand while we cross the street...YES! 8. Alexis thinks I'm capable of building a snow hill big enough for her to sled down. I think the worst part about them growing up is that if I want a baby again I have to actually HAVE another baby. Pregnancy aches and pains, and that awful newborn stage...there has got to be a better way! Pictures of those "awful newborns". My New Years Resolution: Thwart all growing-up efforts made by my children. My brother and his wife are in town this week, it's been a lot of fun to have them around. Yesterday my brother made an observation that I agree with. One trait that members of our family have honed almost to perfection is the ability to annoy people. Jealous? Don't worry, you can develop it to. It's not that hard really, just observe what bugs people, and then do it...a lot. I already knew Alexis had it figured out, but apparently Tyler has too. M: come on, I've heard you say it. Just say "MA MA"
M: good, now say "ma-ma"
...but now it's over and I've got a major case of post-Christmas wintertime blues. Ugh. I just look out my window and think, "I've got at LEAST 3 more months of these useless freezing cold temperatures and the horrible 'slow-you-down' snow." And it doesn't help that I'm a paranoid snow driver, always convinced that the roads are covered in black ice, so I haven't driven faster than 15 mph in weeks. I might as well be driving one of these for as fast as I'm going: Minus the golf clubs. What's the tread like on those tires? I shouldn't complain though because I did have a wonderful Christmas. I was lucky enough to be surrounded by my family and members of Jeremy's family. I'm not sure how I got so lucky to have first, the awesome family that I come from, but then second, to marry into another incredible family, and third, be blessed with my own amazing family. How's a girl get so lucky? There's too many pictures to share, so here's just a few. Does this bag of balls look like trouble to you? It did to me too, but it provided several long minutes of entertainment and wasn't too terrible to clean up (especially if you ignore all the ones that roll under the couch). I believe it even said on the instructions, "Just add laundry basket and kids for hours of entertainment". A Cinderella Barbie, the perfect combination of Disney Princesses (the thing she was obsessed with up until the week before Christmas) and anything Barbie, which is what she decided to like just before Christmas. Of course this means that now I get to hear "Mom, where's my big Cinderella's little glass shoes?" almost as many times as I hear "why?" in a day. Thanks Santa. I gave Jeremy an air compressor, and he had no idea it was coming. It came with a set of air tools so I wrapped those up and put them under the tree, but didn't tell him there was anything else hiding at my parents house. So he opened it up and I managed to convince him that I didn't know you needed an air compressor to use them. I believe when he said they needed air I said, "oh, so do you just blow in them or something?" He believed me! I'm trying to not be offended by that. And I got a stereo so now I can rock out in my living room and not from the computer. I'm very excited about it. One of my favorite gifts, though, was this DVD my sister made. It had a slide show with pictures of our family growing up and some funny videos from our past. It was awesome and something I'll treasure forever. I hope everyone had just as great of a Christmas. And if you live somewhere warm, please invite me to stay with you for awhile, at least long enough for my fingers to thaw. One of my most favorite Christmas traditions is driving around town to look at Christmas lights people have put on their houses. Well, this year we heard about this guy who won some nationwide KFC contest (he now gets free chicken for a year!). He has over 45,000 lights on his house that's choreographed to music. On the news (where we heard about it) they said that every night there's "dozens" of cars lined up to see it. Well, tonight there were "dozens" times 10, and we had to wait about 35 minutes before we could really see it. He lives in a gated community so they kind of patrol the line at the gate and only let a certain amount of cars in at a time. Click here to see his website that has videos of his house on it. And if you are in the area it's definitely worth the wait! He will have it turned off Christmas Eve, and I'm not sure how much longer he'll have it on after that, the website will probably say. It's free but there are donation boxes set up for the Make A Wish Foundation, so take a few bucks! *Kids will LOVE it. Tyler was mesmerized! I've seen this on several different blogs so far this Christmas season and it looks like fun. Plus it's snowing outside and I'm not doing the grocery shopping I desperately need to do, so I might as well do this right? Here's what you do. 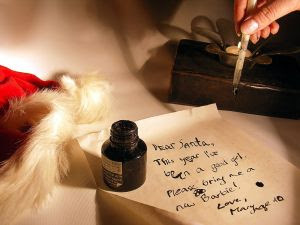 In the comments section (for those of you who do not know, at the bottom of each post you can click on the thing that says "0 comments" or whatever number its at, to leave a comment), leave an ANONYMOUS letter to Santa. Dear Santa, For Christmas this year I would like a new nose hair trimmer. My old one just gave out on me and things are getting...well...hairy. Please. That was just an example, not my actual wish (or Jeremy's for that matter). If you leave something too inappropriate (Aaron) I will delete it. If you accidentally sign your name to it I'll delete it and re-post it as anonymous. Have fun with this people. I have no way of tracing it back to you, so don't be shy! I'll leave one too, somewhere in the mix. santa, gingerbread houses, and a whole lot of other stuff! The other day I dressed Alexis up in a black turtleneck, black tights, and a brown corduroy skirt...she looked "babe-a-lish", as we say in our house. Anyway, later in the evening she announced that she had a surprise for me. She had taken off Tyler's pants all by herself, which he seemed okay with. Then a few minutes later she announced another surprise, she had taken off her skirt too! So I had to take a picture of her all in black. We posed her and told her to make a scary face and this is what happened: I think it's genetic. Here's the evidence. Moving on. Lock up your daughters (any ages 2 and younger) because here's a picture of the studliest guy you'll ever see. Who can resist a fat man in a choo choo train vest? Not me! But don't let that smile fool you, this poor guy's been sick for going on a month. He seems to catch everything that comes our way and it lingers. He's coughing his way through a nap right now. I think everyone in this house is ready for him to get better so we can all get a little more sleep. Here's a cute one of him with breakfast the other day. He likes to have the option of eating from both hands, so put half a banana in each hand and you have a happy boy! As you can see from the earlier pictures we made gingerbread houses this weekend with our good friends Kole and Dorothy. Jeremy and Dorothy both like to make pretty gingerbread houses that take all night, whereas Kole and I seem to have the "just get it done" mentality. So of course ours were the ones the kids got to decorate. Kolbe, Jane, and Kole. Jane had a good tactic for decorating, she just dumped candy on the exact same spot until it was about 3 feet tall. Me and Alexis. Ours had a snow hill there in the front for the little candy Santa's to sled down. My philosophy in gingerbread house building is that the yard is more important than the house structure. Jeremy does not agree with me. See? Pretty house, no yard. Amazing roof though. This is the best picture I have of Dorothy's which is too bad because hers was pretty cool. The roof is covered in necco's. MMMMMM. Question: Why does Santa give kids candy canes? Answer: To bribe the kids that would otherwise have nothing do with him. Like Alexis. Santa came to preschool yesterday. Alexis does not like to be very near Santa so I had to psyche her up for it before school. We made a deal that she did not have to sit on his lap but she did have to go up and talk to him. Here she is talking to him, notice the distance. But I am proud of her, she's had a busy few months full of scary guys between Barney and Santa Claus. Are you wondering what she's asked for? Yesterday she asked for a barbie skateboard. She told me she was going to ask for a barbie but then the first boy to talk to Santa wanted a spider-man skateboard, so of course then everyone in class wanted a skateboard! And she's also asked for roller skates. I keep telling her she should ask for the movie "Cinderella" cause at least then she won't be completely disappointed. Also, she and I talked yesterday. We are going to leave our back door unlocked (except not really) so Santa can get in, and we'll leave him cookies and carrots for his reindeer. And they are NOT going to park on our roof, Alexis won't allow it. Anyone else getting excited for Christmas? Happy 50th post to me! Yup, 50 posts and still nothing interesting to say. I read another girls blog who, for her 100th post, decided to list 100 facts about herself. I think that's slightly presumptuous so I'm not going to do that. Besides, I'm not sure I could even make it to 10. Instead I will try and talk about other things having to do with the number 50. And I'm not even going to list the capitols of the 50 states or their state flowers. *I went to Wal-mart today, fortunately without my kids thanks to mom and dad, and 50 is the number of times I thought to myself "i hate this store". At least 10 of those times were said while waiting for a store clerk to unlock the case that holds their "expensive" jewelry...anything that costs more than $7.88. *50 is the number of times Alexis cried today...she didn't nap. *50 is the number of cars we had to wait in line behind to see the lights at Thanksgiving Point. *And 50 years ago the TV dinner was invented. Actually, I don't know if that's true, but it's a nice segue for the real purpose of this post. (I just looked it up on wikipedia, I was close, they are about 54 years old!) Here's a history of me and TV dinners. When I was younger and we had a babysitter come, my mom would always buy TV dinners for us to eat. It was a huge treat! We'd all run to the freezer, pull them out and decide who gets what kind. 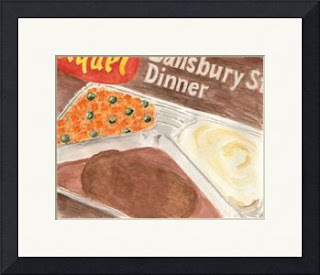 My favorite was always Salisbury Steak, but it was pretty popular so I didn't always get it. 1. Tyler likes fish sticks. 2. Even a blue tray with separate compartments for the food cannot entice Alexis to eat. 3. Jeremy is the only man that dirties a plate while eating TV dinners. 4. The average sized TV dinner is made to fill up an 11 year old that isn't growing too quickly. 5. The "hungry man" dinner is made to fill up an average 25 year old female with a questionable appetite. 6. My mom saved TV dinners for the babysitter because they are so gross she did not want to have to eat one herself. *can anyone tell me what the title of my post has to do with anything?? ENOUGH with the toilet brush already! Is nothing sacred with these children? Yesterday I went snowshoeing with my dad. I've strapped on snowshoes once before while I was up at a cabin hanging out by myself all day (if that sounds boring then you don't have toddlers) and Jeremy was snowmobiling with guys from work. I thought it'd be fun to explore a little bit, but I was too worried about falling through the snow and getting stuck there forever, or at least until the snow melts, so I didn't go far. Back to yesterday. We went up the canyon, put the shoes on and started walking up the road. It was pretty well packed because of snowmobilers, but eventually we took off into the fresh stuff that they can't touch and we followed an animal trail for awhile. Then we headed back down and walked around this little lake that's partly froze over and found this great hill for sledding. Hopefully we'll take the kids there sometime this winter and see what they think of it. Turns out I like snowshoeing! It's really beautiful to be surrounded by so much sparkling white and the peaceful quiet that is a product of the snow. Who would have thought I'd ever say that? Finally, something I can appreciate about the snow! Also this week I got an unexplainable urge to go indoor rock climbing. I have no desire whatsoever to climb real rocks, but indoor sounds like fun. I am afraid of heights, so we'll see if I make it more than 10 feet up! Today the most horrifying thing happened in our family. Probably the worst thing we've had to endure all year. Ready for it? We attempted to take a picture of Alexis and Tyler,with props, in front of the tree, for Christmas cards. GASP! SHOCK! AWE! We did WHAT?? That's right. I thought to myself, "wouldn't that be cute if we took a picture of just the two of them, with a little santa hat and some reindeer antlers, after church while they are all dressed up?" Wouldn't it though? It would, if they weren't 1 and 3 and hadn't already been forced to sit relatively still for the 3 hours previous to this photo shoot. Here's a few samples, neither of which are the one we'll actually send out. Last week I taught Tyler how to kick a ball. I suspect he already knew and it was just waiting to be brought out because he's pretty good at it, as you'll see in the video. And as with handedness, he always kicks with his left. Also in the video is Alexis whistling, which is my favorite thing that she does. You'll notice it's not really a whistle, more of a high pitched yell. Lately she's started putting her fingers in her mouth when she does it, so it's even funnier. Also, please try and contain your jealous feelings over my yellow scout shirt...we can't all be as cool as me and you might as well accept that now. Alexis saw Tyler wearing this (he kept it on for about 35 min) and said, "oooooh, mom, Tyler looks handsome". At least she didn't say pretty, right? And speaking of pretty, Alexis put her headband on all by herself yesterday morning, and even picked out her red velvet pants to match! Ain't she a beaut? And before you think there's nothing more to this girl than good looks, just know that she can down a bowl of fruity pebbles in 4.3 seconds. Impressive, to say the least. In keeping with the holiday spirit of giving, Jeremy and I have decided to give our living room away to our new roommate. This guy needed a home and we rarely use our living room anyway, so we thought, "why not?" He's been pretty easy to have around so far, though he does drink a lot. And he's got a bit of a poky personality, but his smell makes up for it. He will hurt the children if I'm not careful, so I do have to watch that, but he's good at keeping them from snooping at the presents. Here he his, CT. Man, I hate pictures of Christmas Trees. They never make the tree look good. I promise our tree is a lot prettier than the picture shows, and we will get another string of lights for the bottom branches. But seriously, this is the biggest tree we've ever had. We went to a tree farm (thanks Tami! ), picked it out, they cut it down for us and we brought it home. The trees were the same price no matter how tall, so Jeremy said, "If I'm paying that I want it to touch our ceiling". So it did, and it would have even if we had a hole in our floor 2 feet deep. I felt so...traditional walking around the little tree farm in the snow, picking out the tree I wanted. We usually just buy it at home depot, which is lame, so I loved this. And I know, we didn't actually hike into the mountains and cut down a tree ourselves, but that's not an experience I feel I need to have. Now I'm ready for Christmas! *Also, I would like Dorothy to notice that it is NOT a bush. Look what I finally finished! Yesterday Jeremy had to drive all the way out to Battle Mountain, NV (about 5 hours from here) to switch someone out of a truck. So I drove along with him to help when he got tired and to keep him company. We left the kids with my parents for the day because we'd have to be crazy to put them in the car for 10 hours just for fun. Can I just say that Nevada is pretty ugly? It had some nice mountains, but the valleys are not so great, sorry to all you native Navadanites out there. What is a person from Nevada called? Aaron, Tricia, can you tell me? Here's a fun game that my roommate and I played once while waiting for a plane. Think of the different states and then try and figure out what a person from there is called. Example, someone from Utah is a Utahn. Someone from Oregon is an Oregonian. But some of them are not so easy. Like Massachusetts? A Massachusetter, a massachusetite? And don't say, "A New Englander" because there has to be something more specific. Here's a list of some that have me stumped. I'll give a candy cane to anyone that can tell me the correct name of a native from all of these states. It's been snowing all morning so we went out and played in the snow. It wasn't as terrible as I expected, since I hate the snow. The kids had fun and it was so nice to have Jeremy there too. Here's some pictures. After we came in we had some hot chocolate and later today we'll go and get a christmas tree and decorate!! I hate to admit it but the snow is definitely helping to get us in the Christmas spirit.